We have a couple of empty seats that we would like to fill as soon as possible so we have a full band for our summer season of concerts. The current vacancies we have are for a bass trombone player & kit/tuned percussion players. We would also like an additional cornet player to further strengthen the section. 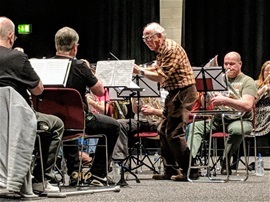 We are busy rehearsing for our performance as part of the Midlands Beer and Brass on the Grass Entertainment contest which is held in Loughborough. This is an annual event that we attend and always have a great time. We have had a high level of success at this contest, most recently coming overall 2nd place in the joint 3rd/4th section last year. As we prepare for our summer season of concerts we are enjoying practising a whole new programme of concert music, which we shall be playing at public events very soon. New music has been purchased, soloists are choosing their solo items and and some familiar classics have been added to our current repetoire. One piece, recently added to our library, that the band enjoy playing is 'Starburst' by Dan Price. Following the area contest we were saddned to lose our bass trombone player Melanie, who is emigrating with her family to Vietnam. This means that we have a vacancy for a new bass trombone player. If you would be interested in filling this vacancy and becoming a permanent member of the band, then please get in touch. On Saturday 9th March, the band participated in the Midlands area regional contest. We had worked hard at rehearsals practising the music and knew we would be competing against some very strong bands. Every though there were a few nerves and the occasional split note and a couple of tuning issues, overall the band were pleased with their perfomance, and we were awarded 11th place which is an improvement on last years result and maintains our position in the 3rd section of the grading tables. So we know what we will need to work on over the coming year to further develop the standard of the band. On Saturday 16th February, the band participated in a workshop in preparation for the area contest in March. We were joined by some guest tutors which included Thomas Fountain, Chris Jeans, Trevor Groom, Nathan Waterman and Mike Smith who worked with each section to develop and refine our performance. After lunch, we came together as a band and performed again, this time under the musical direction of John Berryman, who also included his thoughts and suggestions for further improvements to our performance. A great day was had by all and a massive thanks to everyone involved in organising the event. We are thrilled that Myfanwy Jones has joined the band to play in the percussion section. Myfanwy's brother already plays in the band and we were in need of an additional percussionist to play at the area contest and luckily for us, Myfanwy agreed to accept the challenge. In December last year, the band was busy providing festive cheer to shoppers in supermarkets in Corby. We were overwhelmed by the generosity of the shoppers and so we made the decision to donate a percentage of our collection to a local charity. 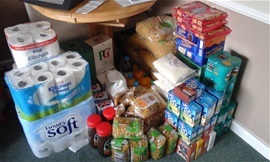 We used the money to buy food and other essential items which we donated to support the good work untaken by volunteers at the homeless shelter, Corby Nightlight. Needless to say, the donation was gratefully received.